Today, I would like to talk about new implemented firewall in Fedora (18 and above, I guess) which is called FirewallD or Dynamic Firewall. 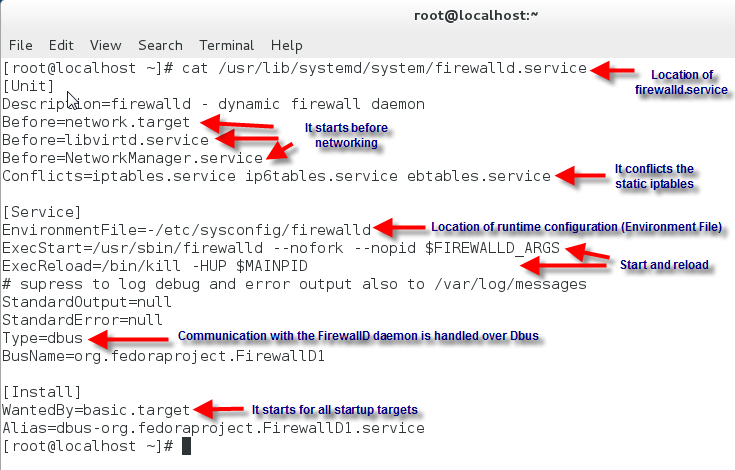 FirewallD is more powerful and flexible compared to old static firewall. 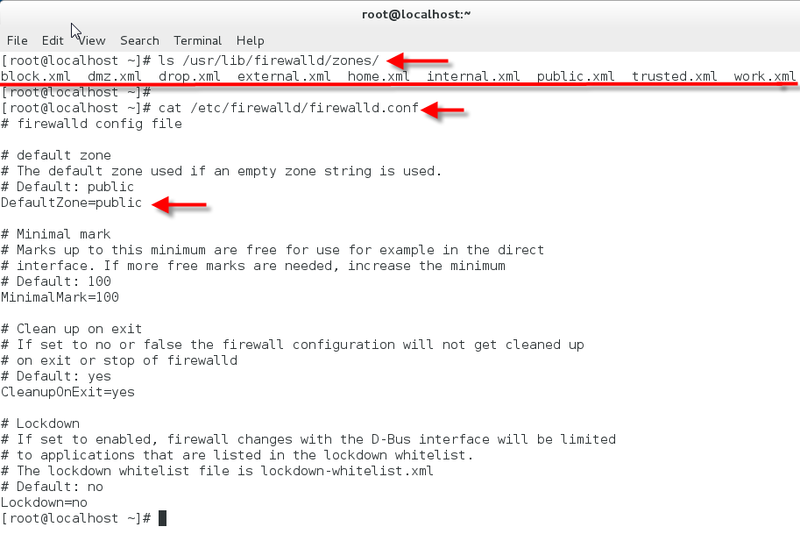 In static firewall, you list a set of rules and then firewall reads them by restarting your firewall, however, in new FirewallD you apply modified rules without restarting firewall. In fact, FirewallD does not use netfilter rules in the traditional sense. In other words, you cannot use the iptables command to add firewall rules for the Firewalld daemon. They conflict with each other. And, of course you can use the old iptables firewall, however, you have to first disable FirewallD which is not a good idea in my opinion. Let's take a look at inside firewalld.service Figure 1. I tried to put all explanations inside Figure 1. By the way, D-Bus is a free and open-source inter-process communication system, allowing multiple, concurrently-running computer programs (processes) to communicate with one another. drop (immutable) Deny all incoming connections, outgoing ones are accepted. block (immutable) Deny all incoming connections, with ICMP host prohibited messages issued. dmz For computers publicly accessible with restricted access. Default zone is defined in /etc/firewalld/firewalld.conf. Figure 2. Location of default and fallback zone files (in xml format) are in /usr/lib/firewalld/zones Figure 2. Zone configurations are located in /etc/firewalld/zones. firewall-cmd is a command line to set your firewall with so many options. There are two options to save your changes. One is Permanent and the other one is runtime. Runtime changes are deleted after reload or restart. Permanent option will be there even after reload/restart/reboot. firewall-cmd --get-zone-of-interface=interface --> Print the name of the zone the interface is bound to or no zone. 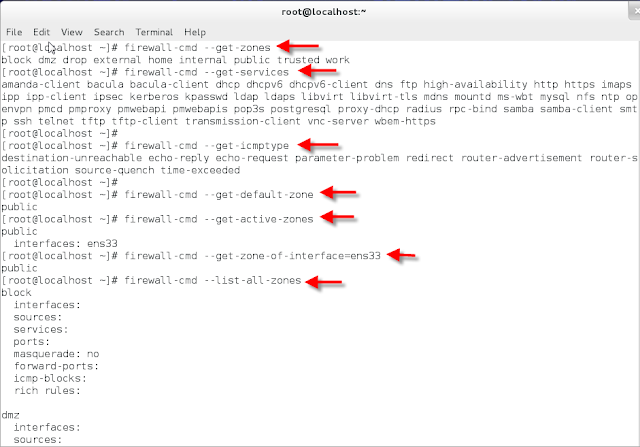 firewall-cmd --list-all-zones --> List everything added for or enabled in all zones. firewall-cmd --zone=dmz --add-masquerade --timeout=30 --> Enable IPv4 masquerade for zone. If zone is omitted, default zone will be used. If a timeout is supplied, masquerading will be active for the amount of seconds. If you want to use custom rules, you can use --direct option. The direct options give a more direct access to the firewall. Direct options should be used only as a last resort when it's not possible to use for example --add-service=service. firewall-cmd --direct --get-rules ipv4 filter INPUT --> Get all rules added to chain INPUT in table filter as a newline separated list of the priority and arguments. firewall-cmd --direct --add-rule ipv4 filter INPUT 0 -p tcp --dport 22 -j ACCEPT --> Add a rule with the arguments args to chain INPUT in table filter with priority 0. The priority is used to order rules. Priority 0 means add rule on top of the chain, with a higher priority the rule will be added further down. Rules with the same priority are on the same level and the order of these rules is not fixed and may change. If you want to make sure that a rule will be added after another one, use a low priority for the first and a higher for the following. If you want a comprehensive list of options, please refer to man page. I read Ferdora 19's man page and it's much nicer than before in terms of explanation. And that's all. Hope you enjoyed. Great post! I've only scanned it, but I can tell it will be very helpful to me on my fc20 system. Thanks so much! Fantastic blog!!! This blog helps you to solve your any knid of windows 7 firewall error , its can get instant service provider.go through this link. Bro i learned a lot from your site!!....thanks!! Could not get the interfaces to stay to the zones they belong after # systemctl restart firewalld.service. All the interfaces move back to the default zone. In order to get this working correctly need to modify the ifcfg-eth0 file in the /etc/sysconfig/network-scripts/ folder and add ZONE=, then it will be put in correct zone on restart/start otherwise default. The --runtime-to-permanent option doesn't exist in RHEL 7! Can you please tell how to save rich rule in any XML file using firewalld like we have iptables-save> in iptables service? It has been a good tutorial Thanks. I am facing one problem i have a FTP server which is accessible from 30 IPs from different part of the world. Earlier i have created a rule to access them EX: -A INPUT -s 162.23.24.226/32 -p tcp -m tcp --dport 21 -j ACCEPT. I don't understand what would be the firewalld command for this rule . Is there a way to find out what ports are associated with a service (from firewall-cmd)?? 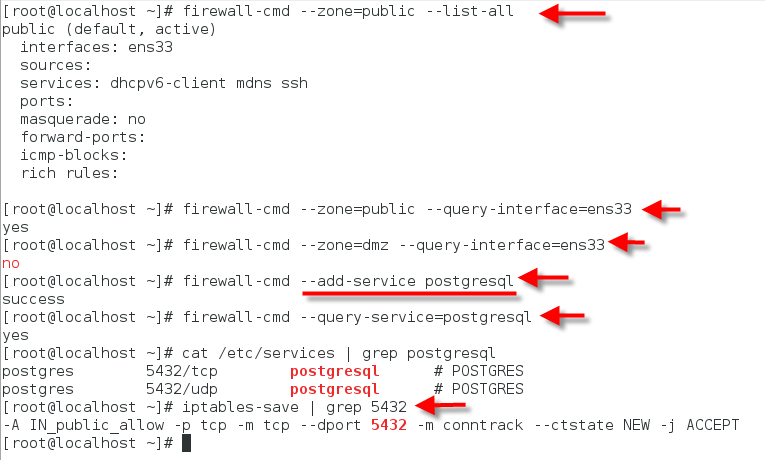 In RHEL6, we have a "reload" option in iptables to retrieve the changes without breaking the existing connections and to apply the modification done. So how come firewalld is dynamic as compared to iptables(which is being termed as static). Now days everyone uses Internet therefore security for Computer is the first. Therefore we need to get a Best Firewall Security.. Thank you for giving updates of how firewall works..? On the off chance that you are confronting issue in restarting Postgres benefit then it would appear that you are utilizing framework based Linux. Likewise did you check whole PG bundles are at 9.5? in the event that as indicated by you these things are immaculate and as yet standing up to this issue then it appears something vital. Presently you have best choice to handle this specific issue i.e. Postgres SQL Support for Windows or Postgres SQL Support for Linux. At this stage we manage these issues in a creative way and give best of best help. Thanks for sharing valuable information. I write a article on Firewall if you interested go here How Does Network Firewall Work? Thanks for providing such a valuable data related to firewall services, i am working with a company which provide firewall support services in USA and this kind of information will be really helpful for people who just started their career in the same.